Apologies for the absence lately, it has been a hectic time at work and for other endeavors lately, but our deadlines have now passed and we can return to a more regular posting routine that we are accustomed to. Just in time, too, as the NYC Marathon is just over two weeks away, so watch for our previews of that one as Paul Tergat and Paula Radcliffe try to add to their previous victories in that race. But for now let’s look back to the Chicago Marathon, where much was said about the weather conditions on the day. All the fuss was due to last year’s oppressive conditions which forced the organizers to close the course early and send people back to the finish. It was a cooking day in Chitown last year, to be sure, but this year it was a stunning day—and we have the data to prove it! A look at the past three runnings of the race reveal three vastly different days. In 2006 it was a miserable day—cold, in the 30s or 40s F, if I recall, and overcast the entire time. Generally a dreadful day to run a marathon! 2007 was quite literally burned into our memories – it was already in the 70s F at the start, with no wind, and glaring sun that baked an already hot city into the 90s F by day’s end. These graphs show the “official” historical data on the Weather Underground site. Temperature data are on the left, while relative humidity data are on the right. We took values from the same station, so there is no bias in that sense. The big difference is the starting temperature—it was over 10 F lower this year, and so even though the humidity was similar at the start I can tell you it was a vastly different day. And from 11:00 the humidity was consistently 10% lower than last year. This year’s weather was something runners know about. It was one of those days where you step outside in your running kit and think, “Hmmm. . .maybe I should bring a long-sleeved shirt with me to the start because I might get cold standing around before the gun.” Last year, on the other hand, was muggy, hot, and oppressive. The preceding month was unusually warm for fall in Chicago, and every morning was hot and humid even before the sun came up. You never felt cool last year in September during your morning run or ride, I can tell you that much. But the official data tell only half the story, and after last year the race organizers knew they needed something more to inform them about the conditions on the course. 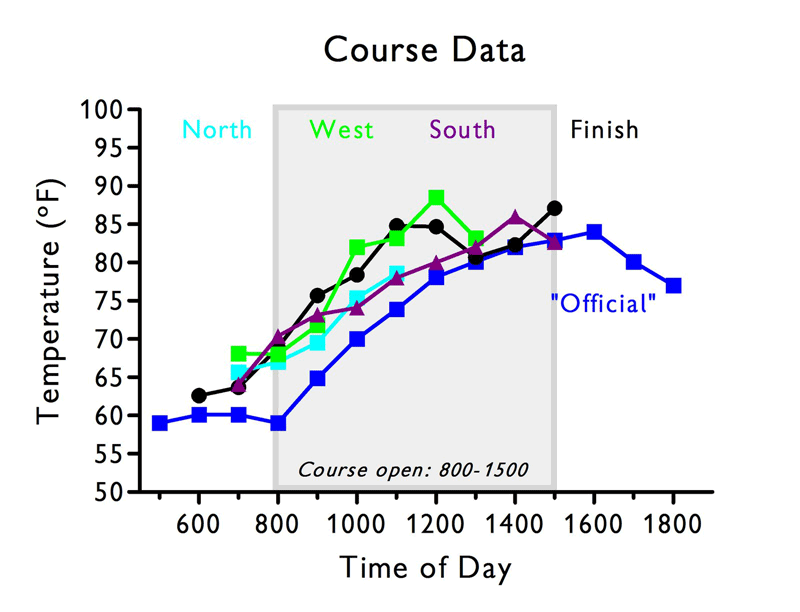 The problem last year was that around 11:00 it was clear to the officials that they were going to have problems if they kept the course open as their “peripheral” resources, i.e. ambulances on the course, were all deployed and transporting runners to local hospitals. Therefore it was the best decision they could have made to close the course, because had anything else happened they would not have been able to respond to it. Again, temperature data is on the left and humidity data on the right. 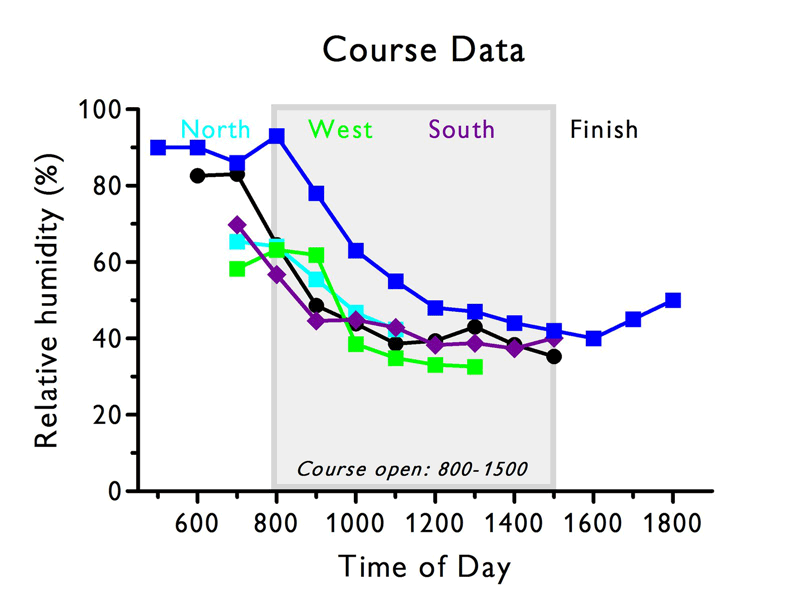 The first noticeable detail is the the readings we took on the course are quite different from the “official” data. This might not be a surprise as that weather station is likely distant to the race course, and weather is a very local phenomena. But still, as far as we know this is the first this this kind of discrepancy has been shown, and the important implication is that if you organize an event and want to know what is happening on your course, you must collect the data yourself and analyze in real time to see how things are changing and exactly what is happening. During portions of the race the difference between the “official” values and the data we measured was as much as 40% for the humidity and 11 F for the temperature. In addition, the difference between the northern-most station, located near mile eight, and the finish was 6-7 F. The reason is probably because that part of Chicago, the neighborhood of Lakeview, consists of heavily shaded narrow streets. Compared that to the finish in Grant Park, which is totally exposed to the sun, especially for the first half of the day as it is eastern border is Lake Michigan. So based on the data, one has to ask, “Why not run the course in the opposite direction?” After all, temps in Lakeview were 5 F lower when we stopped collecting data at 11:00 there! Of course we did not measure into the afternoon, and by then the temps on the northside might have been similar to the finish. 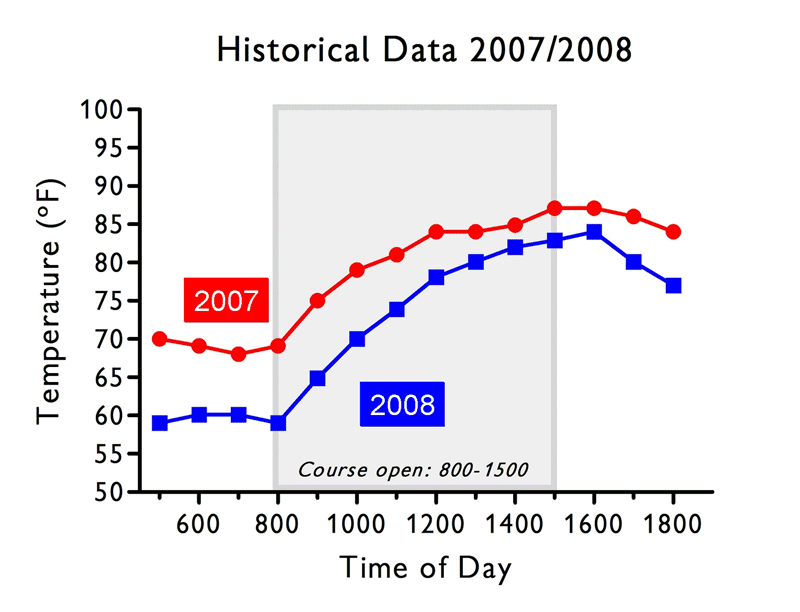 But this is a good example of how science and data can drive critical decisions that might improve future events. Was the weather a factor? This question is being debated in the comments section for the race report, and we have people weighing in on both sides. Was it hot? Yes, it was, and the air temperature was close to what it was last year, in fact. The humidity was much lower, though, and the real difference was probably the starting temperature and the fact that the weeks prior to the race this year were generally much cooler. Overnight lows have been solidly in the 50s F since the beginning of September, and so the city never really heated up like it did last year. The conditions were far from “ideal,” but then again they were not dreadful by any stretch. It was a stunning day in Chicago, and normally wuhen the environmental conditions are considered “hot,” it shows in the winning time. Evans Cheruiyot’s 2:06:25 was incredibly fast, and not indicative of a winning time in “hot” conditions. That said, the conditions were not ideal for world record-type performances. On the day, in ‘real-time’, we wrote somewhat arbitrarily that the elites were probably slowed by about a minute as a result of the temperature, which seems reasonable, even now. The early pace in the elite race was too fast, given the conditions. They paid for it in the second half, with the exception of Cheruiyot (who did also slow down, it has to be said), and large time gaps were the result of the super fast early pace, combined with the conditions. However, for the vast majority of the field, the conditions were not harmful, and the athletes running anything slower than…oh, about 2:08, were never, ever in danger of heating up too much, or becoming critically dehydrated. I was sitting at the entrance to the medical tent, and in time we will analyze the data regarding symptoms, number of admissions, time to discharge, etc. One anecdote I can share now, though, is about a runner who must have run about a 3:15 or so, judging by what time he came to the tent. He was on the back of one of the golf carts used to get collapsed runners from the finish to the tent, and was sitting up with a Gatorade cup in his hand. As he passed us, he recoiled and spewed what must have been a beaker full of vomit. That in itself was not remarkable, but the volume was—the poor guy must have puked 500+ mL of Gatorade/water! Yet there he was, trying to drink MORE, probably because he’d been told he felt so terrible as a result of dehydration! Dehydrated, with maybe a liter of fluid sitting in his stomach… if something doesn’t strike you as being “wrong” with that picture, then nothing will He had no business with that kind of volume in his stomach, and in case you missed it last year you should read our series on dehydration and fluid intake. Just click the Featured Series tab above for the links. In the meantime feel free to weigh in, especially if you ran the race, and watch for more data from the medical tent as we analyze that!